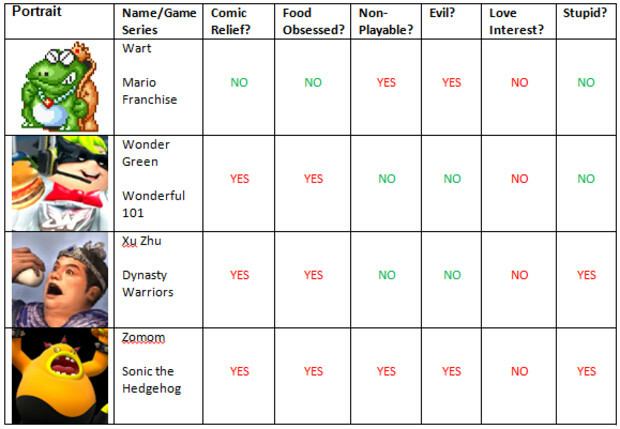 After reading Jonathan Holmes' fascinating analysis of prevalent features in black male characters, I decided to do a similar one on another minority: fat guys. In modern society, overweight people are regarded as abnormal, freakish, lazy, and even diseased as the phrase "obesity epidemic" has taken over the news media. It's come to the point where "fat acceptance" is a thing. People think that fat acceptance encourages people to be overweight, but they're wrong. It's mainly just about people trying to feel human again, and trying to enter into modern society without feeling ashamed every time someone glances in their direction. 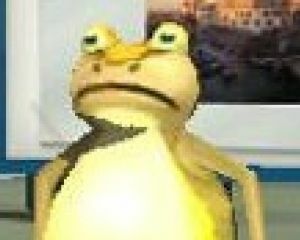 I think this idea that fat people are different from "normal" people has manifested itself in videogames through a collection of overused tropes, which is the main reason I chose this topic. 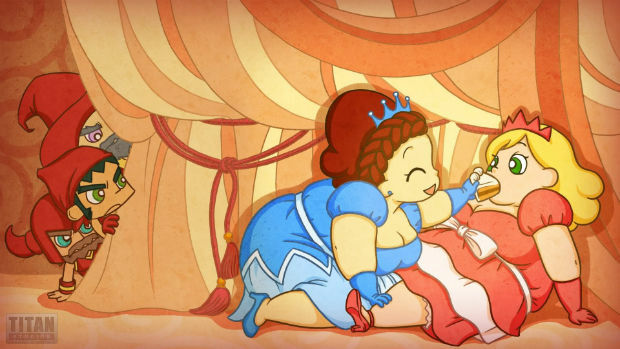 I would have liked to do another feature on fat women in videogames, but there's a big problem with that idea: women still aren't allowed to be fat in videogames. 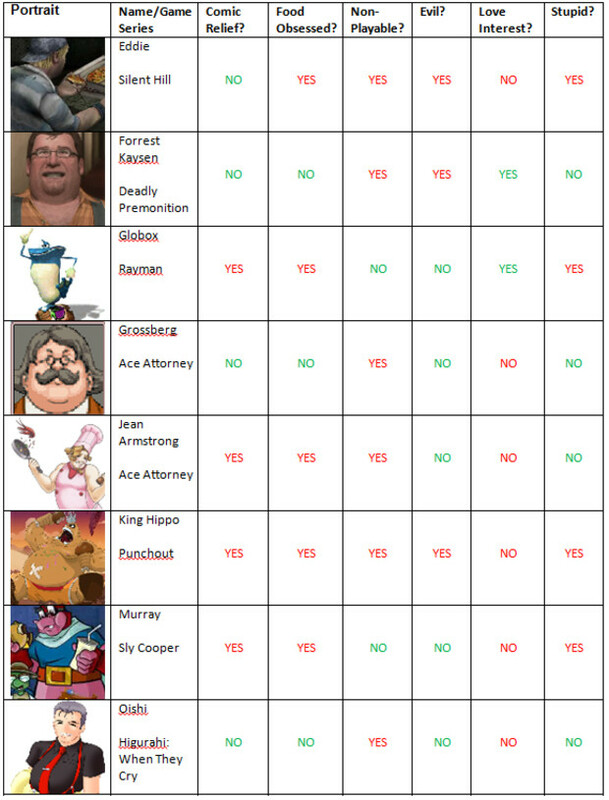 I was only able to find about four characters that would work, with half of those from Phoenix Wright (and another being Fat Princess), so "fat guys" will have to do for now. 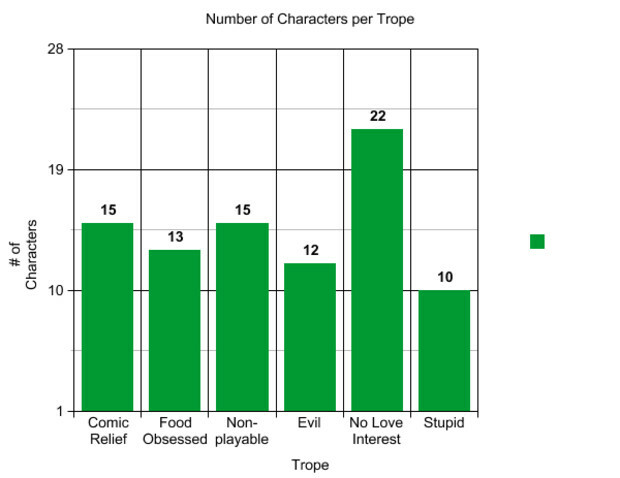 I came up with 6 common tropes to use in my charts: Fat people are usually comic relief, stupid, and food obsessed. They are also usually non-playable and have no love interest (love interests are always reserved for thinner main characters, because media acts like fat people aren't deserving of love, not even from other fat people). If the fat character lacks most of these, they are often a villain, because fat usually = greedy and therefore evil. I ended up with 28 different characters after a long time of searching. 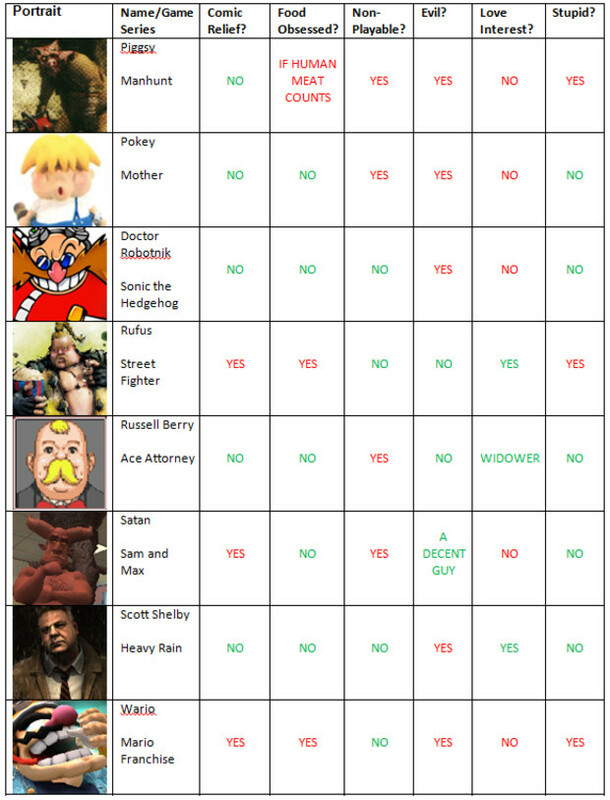 If anyone can think of any more, feel free to contribute in the comments. 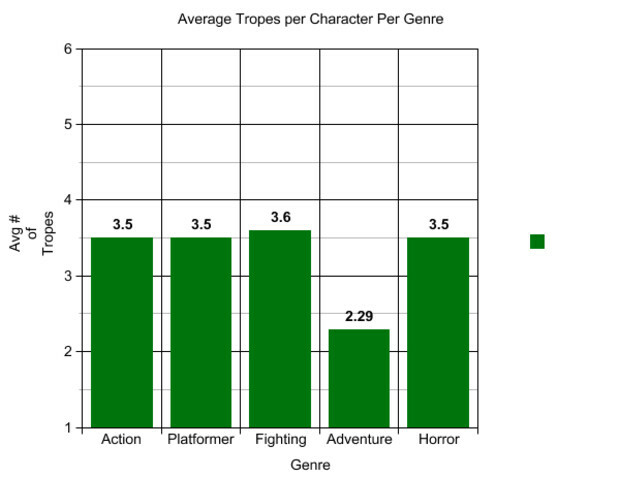 As you can see, the "adventure" genre is the clear outlier, with only 2.29 tropes per character on average. In my opinion, other genres should aspire to be as unique. What do you guys think? Are fat people underrepresented? 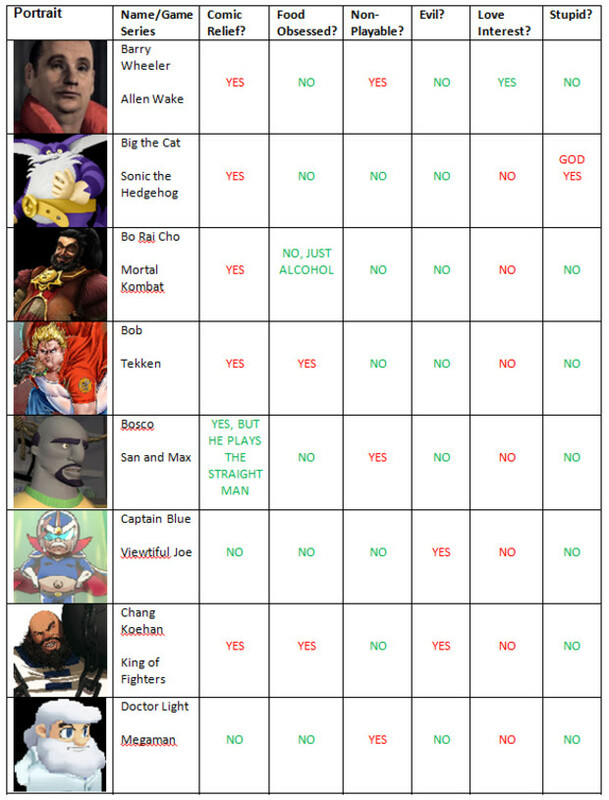 Do the characters rely too heavily on stereotypes? I think so. Any thoughts on the subject are appreciated. Thanks for reading!